Driving up Highway 101 through the Gaviota Tunnel west of Santa Barbara, you might be unaware that a natural hot springs is less than a mile from the roadway. Gaviota Hot Springs is more warm than it is hot, but the blue sulfery water attracts its share of bathers. The springs are half a mile from the trailhead and only a tenth of a mile off the trail to Gaviota Peak, making it a nice detour if you have tired legs to soak. From the trailhead cul-de-sac just off Highway 101 in Gaviota State Park, begin hiking up the wide fire road, which climbs 150 feet over the first quarter mile to a junction with Trespass Trail (an alternate route to Gaviota Peak). Turn left and continue up the road to the next junction located alongside a creek. This is the water flowing down from the hot springs. Turn right and follow the water to its source. 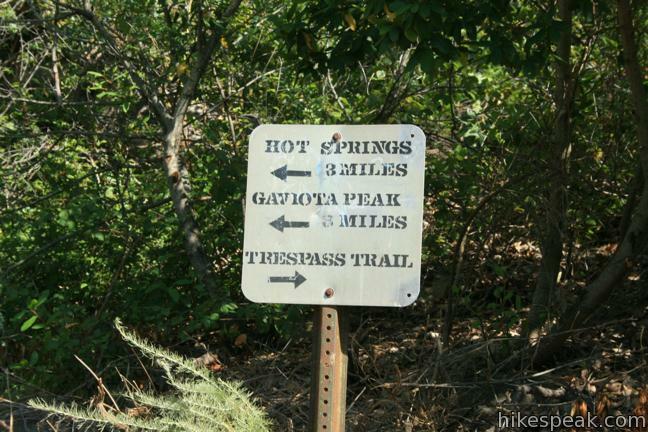 A tenth of a mile up this overgrown single track, you will arrive at Gaviota Hot Springs. 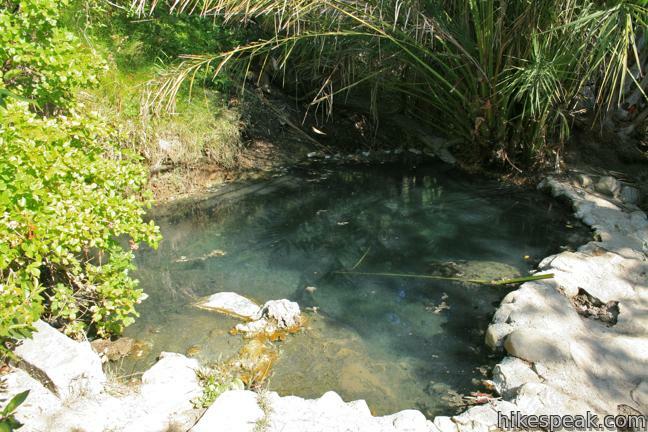 Some time ago, the small springs was built up with cement and separated into pools. Proceed up to the top pool which is deep enough to bathe in, but not to swim. Sulfur bubbles warm the milky blue water. Gaviota Hot Springs is on the small side, and the water would be more inviting if it circulated a bit more, but the springs is definitely worth checking out on the way to (or back from) Gaviota Peak. 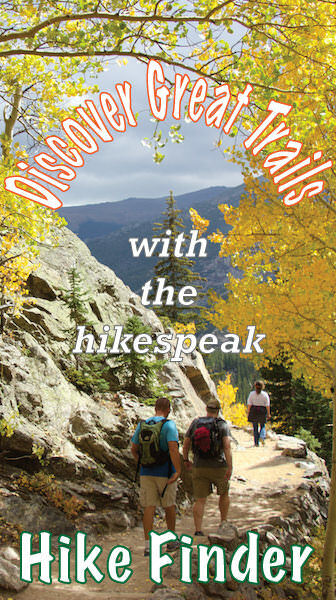 Done on its own, this is a one mile hike with 400 feet of elevation gain. A $2 fee is charged to park at the trailhead. To get to the trailhead: From Santa Barbara, drive 30 miles west on Highway 101. When the freeway turns inland, pass the Gaviota Rest Area and drive 1.5 miles to the next exit (132) labeled California One (Lompoc / Vandenberg AFB). At the top of the ramp, turn right and make another immediate right on the unnamed Gaviota Park Boundary Road. Continue 1/3 of a mile to the cul-de-sac at road’s end. From Buellton to the north, take the 101 South for 8 miles to the exit for California One. Turn left across the freeway and make a right on the frontage road to the trailhead. These photos were taken in July of 2011. Click to enlarge. This short 0.65-mile hike visits an 80-foot tall fern-lined waterfall. With 39 sites situated right next to the beach and proximity to many hiking trails, this coastal campground has a lot of appeal. This 132-site campground offers oceanfront camping along the coast west of Santa Barbara, just three miles from Refugio State Beach. 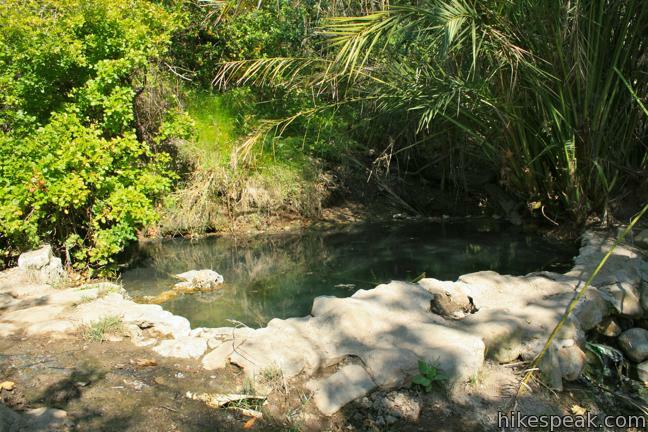 Gaviota Hot Springs is a great trail and time for that matter! I was there this past summer and it was nice and hot and the springs were beautiful. I tend to stick to SB trails but I made the trek out there to check it out and it was so awesome! Great day hiking some new trails that I will now forever go back to. The hot springs is totally worth the trek out there. Short way up the hill and you’re there and on a nice evening, this is the place to be! My local friends showed me this place when I was in town and it was one of the best places I’ve ever been in town! Just beautiful and natural in every way. This is a short hike. We brought our two little boys – 6 and 3. The fire road is wide and well maintained. The last 1/10th of a mile of single-track from the fire road could use a little work. I’d bring a knife and some gloves next time to clear out some of the poison ivy starting to encroach on the trail up.